I know little about Germany's Nine-T-Nine, but I'm glad their latest album celebrating their tenth anniversary, Keep The Flame Alive showed up in my post. NTN has all the right ingredients to create entertaining and enduring melodic rock with an AOR flavor: great vocal harmonies, excellent keyboard parts and the powerful work of two guitars on top of a driving rhythm section. The band is a seven piece with two vocalists, male and female, which adds to density and intensity in composition and performance by all members. The songs are well-crafted and executed with precision; the production is crisp and clear. In style, Keep The Flame Alive is unapologetically straight out of 1980's melodic rock being reminiscent, thanks to lush keyboard presence, to a band like Toto, or at times and elsewhere akin to Loverboy. Comparisons aside, NTN develops their melodic rock well. Several songs stray more toward milder AOR like Caught In a Trap or The Way You Touched Me. Yet, NTN can deliver stronger rockers like the edgier Not Easy to Forgive or Faith. Ballads are in abundance on Keep The Flame Alive with Bus Stop being one of the better ones. Overall, the entire disc is a pleasing and entertaining dose of rock ear candy. However, I did have some difficulty at times with a few things. Though vocalist Sharky's performance is passionate, he often sounds as if he's straining; it took me a few songs to ease into his style. Also, several of the songs are just too long and could have been made more efficient and complete with abbreviation; most notably Caught In a Trap, The Way You Touched Me, and Light My Life (though this song is still probably my favorite on the album). Finally, as much as I enjoy ballads, after the third one, and two back to back Bringin' My Love and Can You Feel All the Days, I was quickly bored as I found them good yet tedious. In the end, however, Nine-T-Nine's Keep The Flame Alive is a solid platter of finely crafted melodic rock songs. The ballads are too many and a bit tedious, but this is still an entertaining and pleasing collection from a first class band. Recommended! 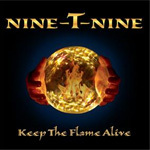 Nine-T-Nine's Keep The Flame Alive is a solid platter of finely crafted melodic rock songs. The ballads are too many and a bit tedious, but this is still an entertaining and pleasing collection from a first class band. Recommended!